I’m always up for reading books that deal with creativity and self-improvement. Creative Confidence: Unleashing the Creative Potential Within Us All certainly did not disappoint in this realm. Coming from the two guys who started the Stanford d.school and IDEO, I was excited to read about their perspective on creativity and design. While the book does feel somewhat geared towards business professionals, there’s so much in this book that applies to everyone, and that can work in amazing ways for teaching design thinking in the classroom. I love that the very first topic they tackle in this book is the myth that creativity is a fixed trait, that only certain people are creative and that if you’re in a “serious” professional like business, you can’t be creative. They tackle this notion by demonstrating how we’re all creative as children, but as we get older we begin to fear social rejection, so we gradually just start to go with the norm. To develop creative confidence in ourselves, we need to exercise our creativity muscles. We need to believe that we can effect change. We need to seek out experiences that can spark creative thinking. We need to look for opportunities to have small successes as we build our creative confidence. I believe that this part of Creative Confidence directly applies to what we do with our students. If a student’s very first experience with tinkering is something very difficult or complicated, they’re likely to feel defeated and shut down. By starting them with an easier or familiar experience, we can build up their confidence so that they’ll be more prepared for the harder tasks. Students need both a “reasonable hope of success” and the chance of an epic win. There’s a reason why many of us get our best ideas while in the shower, while taking long walks or while otherwise allowing our mind to wander 🙂 We need to find a way to allow our students these opportunities as well. I’ve often noticed students who seemed to be doing anything but what the task at hand was supposed to be, but later on they wow me with an amazing idea they’ve come up with. They needed to have that “messing around” time in order to figure out their ideas. One of the things that gets mentioned over and over again in this book is the importance of getting away from the obvious solution, trying many quick prototypes, failing often, and eventually coming up with something spectacular. If our students focus too much on that one perfect solution, they’ll miss out on all the other amazing possibilities. By allowing our students to try many possible solutions, they’ll come up with a better one than if they just focused on the “best” solution from the beginning. Creative Confidence wraps up with a set of creativity challenges to use in groups. While they seem a little more written towards groups of adults, these activities could easily be used in a classroom, with a student leadership team or as a professional development session. Several of them are available on the d school’s website, so check them out. So many times in my makerspace, I’ve heard students insist that they aren’t creative, then go on to make something incredible. 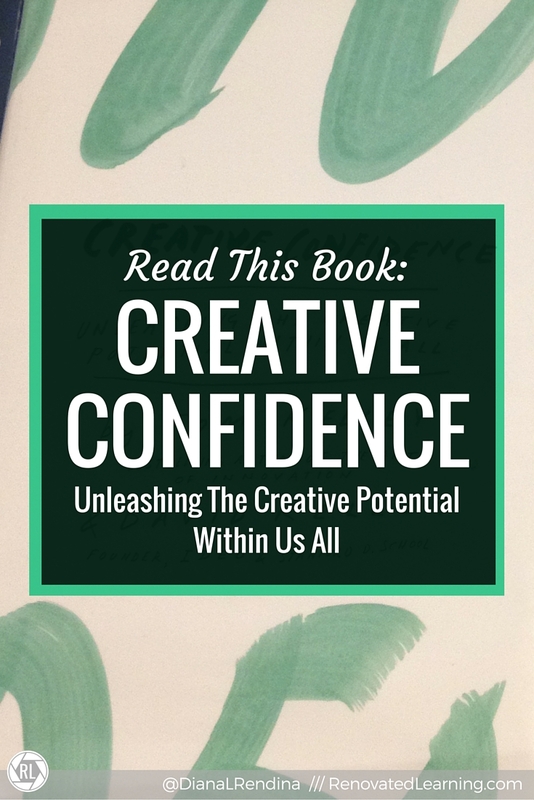 Creative Confidence is an important reminder of the creativity inside of all of us and offers powerful strategies for unleashing it. How do you build creative confidence in yourself? In your students? I started reading this last week per your suggestion! Great book!